Always, always isolate a rescued cat or kitten from your pets for at least fourteen days and until it has been examined by your veterinarian and tested for lethal disease; even a tiny kitten can pack a killer virus or parasite. Make the kitten comfortable in a room that is frequently visited by you and that is separate from your other pets. Wash your hands with an antibacterial soap between visits to the new animal and your household. Consult with your veterinarian so that you are able to weigh the risks against the many blessings of taking in an orphan kitten. If the kitten is lethargic or cool to the touch, you may have a life-threatening emergency (such as exposure or distemper). Get the kitten on a heating pad or other primary heat source (see item 2) and get it to a veterinarian right away or consult an emergency veterinary clinic. Do NOT feed a chilled newborn -- you will kill it. Instead, administer slightly warmed Pedialyte (an infant rehydrating fluid, available in any grocery or pharmacy), using an animal nurser, syringe, or dropper. (You can greatly extend the life of the Pedialyte by freezing it as ice cubes, bagging the cubes and storing them in your freezer, by the way.) Feed the kitten only when it is warmed and indicates it is hungry. If the kitten seems over-warm and/or is breathing rapidly, it may be feverish or suffering from heat exhaustion or worse. Contact your vet or an emergency veterinary clinic immediately for advice if you can. To help lower the kitten's body temperature, try wiping it down with a cool, damp cloth; then administer Pedialyte. Get the kitten to a veterinarian as soon as possible. A newborn kitten is not capable of generating or maintaining body warmth and must depend on its mother (and now you) to sustain warmth and life. Keeping a newborn orphan warm (even on a warm day) is a priority, more important initially than feeding (do NOT feed a chilled kitten, by the way -- you will kill it). Bundling up the kitten will do no good; it has no body heat of its own to retain. And putting the kitten near a space heater or other heating element is neither sufficient for the long-term nor safe. Wrap a heating pad, set on low, in a towel or flannel and place it in or beneath the nesting box, leaving room for the kitten to crawl off the heated area as needed. Emergency, short-term measures: If you don't have a heating pad, put the kitten on a wrapped hot water bottle or snuggled against a tightly sealed and well stabilized jar of warm water. Better yet, put the kitten next to your body -- next to the skin if possible. Then go out and borrow or buy that heating pad after the first feeding or take the kitten to the vet immediately if its condition is poor or questionable. Newborns cannot evacuate their bowel or bladder unassisted. The kitten you have found may be in excruciating pain or in danger of going toxic from having to retain its own body waste. You should help the kitten empty its bladder before proceeding with warming or feeding or even the trip to the veterinarian. 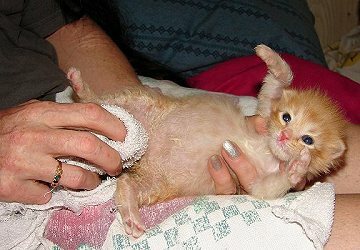 With the kitten on a towel in your lap, lightly rub the kitten's body with a rough, dry washcloth. (At that point, the kitten may roll over or otherwise present its bottom to you.) With a generous handful of soft tissue (a good idea to have handy at all times) gently stroke the kitten's behind, keeping the tissue in contact. The kitten should oblige by urinating a rather amazing amount. Simply rotate the tissue until kitten stops urinating or the tissue is soaked, whichever comes first. Another method to stimulate evacuation is to use a tissue or wash cloth moistened with warm water instead of a dry cloth or use a moistened Q-tip(hold the kitten over a sink or a folded towel if you use the latter method). 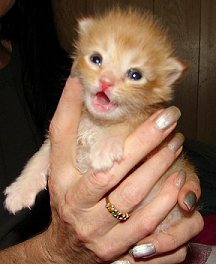 Never feed a kitten cow's milk or human baby formula as this causes stomach upset and severe diarrhea. If a kitten is already dehydrated, this could prove fatal. This includes condensed/evaporated canned cow's milk! There are several good milk replacers on the market, available in liquid or powder form (my personal favorite is called Just Born). The ready-mix liquid is more convenient. Be sure the product is engineered for kittens and that it is fresh (some have a short shelf-life). Milk replacers can be found in any pet supplies store, most veterinary clinics, and even in some variety stores. 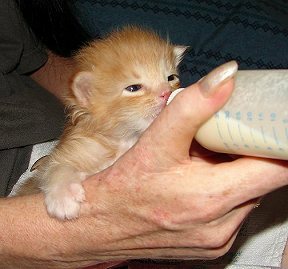 If the kitten seems weak or ill and you cannot get to a veterinarian right away, you should administer slightly warmed Pedialyte before offering the milk replacer.